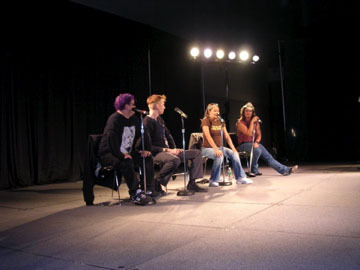 Anime Unscripted is the premier improv event for anime conventions in the United States. Formerly known as "Whose Line is it Anime? ", the event has been held over a dozen times at more than a handful of conventions. 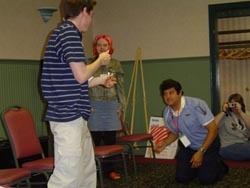 Kirby Morrow, Brad Swaile, Ted Cole, and Tiffany Grant during "Let's Make a Date"
Mark Matney acts out a scene dressed as his character from You're Under Arrest as audience members participate. 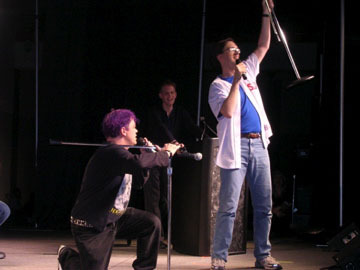 Greg Ayres and PatrickD perform in "Quick Change" as Chris Patton takes control. Greg Ayres gets into the act as Chris Patton, Cynthia Martinez, and Scott McNeil await their assignments.